…And in a move that should surprise NO ONE who read yesterday’s Spreadable Ranch Cream Cheese post, I present to you: PRETZEL BAGELS! 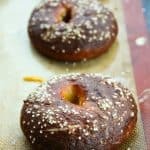 I’m the Queen of Predictability following up a cream cheese recipe with a homemade bagel one, I suppose, but these Pretzel Bagels are just WAY too good for me to hang onto them in my list of recipes I have to share with you. Besides, now that you have all that tasty cream cheese spread, you’re going to need something equally fabulous on which to spread it, right? 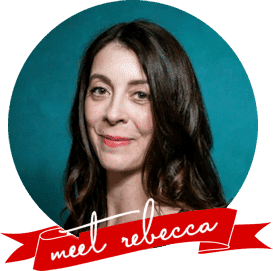 I’ve both discussed my love for soft pretzels (here, here, here, here, and here) and given my steadfast assurances that making homemade bagels is far easier than most people expect it to be. I’m going to say it again: Don’t Fear the Bagels! If you have any kind of comfort level working with yeast, this should be easy peasy for you. If you’re frightened of yeast, stick with me. I’m going to break it down as only an obsessive compulsive can. The dough should be just about double in size what it was after mixing. The dough should look puffy. Not full of large air bubbles and pockets, but puffier. I’ve seen all sorts of ways to form bagels. I’ll save you the tedium of reading a list of ways to form them, and simply tell you my favourite method. After the first rise, divide the dough into evenly sized balls, cover with a towel and let them rest for 20 to 30 minutes. Gently stretch the dough -rotating it a quarter turn after each stretch- without squeezing or deflating the dough. Be as gentle as you can while still making the center hole larger. Make certain to leave enough space between the bagels when you lay them down on the sheet tray. These will be the positions they return to after being boiled (at which point they will expand) and the same positions in which they will be baked. Your bagel making life will be almost infinitely easier if you invest in a couple silpats. These offbrand ones are only $12 for a set of two and are the best insurance policy to prevent your rising bagel dough from sticking to the pan before boiling and your boiled bagels from sticking to the pan during baking. There’s something about a boiled bagel that just desperately wants to stick to parchment paper or a pan. You can, alternately, grease the business out of a pan and sprinkle it generously with cornmeal, but I think the silpats are less fuss and more effective. 2/3 cup of baking soda is NOT a typo. You are drastically altering the ph of your water in order to encourage deeper browning and a chewiness to the outer layer of the bagel. Without the baking soda in such large amounts, you can’t get that typical soft pretzel brown! The wider your pan for boiling, the easier it will be to ease the bagels into the simmering water, flip them when the time comes, and remove them from the pan. I like to use my Everyday Pan, but any good, deep stainless steel skillet or wider stockpot will serve, too. I think my fish turner spatula is the best tool for turning the simmering bagels AND taking them out of the drink. The water seems to drain away from the bagels better when I use this than when I use any other slotted spoon or spatula that I own. The little curved lip of the spatula keeps the boiled bagel from splatting back into the water quite as much, too. I prefer to brush my bagels with beaten egg white to keep the salt stuck to it, but if you avoid eggs, you can either brush with water or with a flax egg to keep the salt adhered. Speaking of salt. Use pretzel salt if you have access to it. It’s not just that the pretzel salt gives that characteristic CRUNCH that you think of when you think ‘soft pretzels’ but it also resists melting which is a good thing since you’re putting it on a wet bagel. If you can’t lay your hands on pretzel salt, or don’t feel like making a special purchase, you can use coarse kosher or sea salt flakes. Before the bagels go into the oven, I use a sharp knife to slash the dough at 1/2-inch intervals to a depth of about 1/8-inch. This allows the steam to escape without bursting through the skin of the bagel. It’s optional, but I like the way it looks. Combine all the ingredients for the dough in a big mixing bowl and stir with a sturdy spoon until a shaggy dough comes together (alternately you can use a stand mixer with a dough hook if one is available to you.) Turn out onto a clean surface and knead until smooth and elastic. The dough should be quite a stiff dough, that's okay. Place in a greased bowl, cover with a damp towel or plastic wrap, and let rise in a warm, draft-free place until doubled in bulk. Turn the dough out onto a work surface and divide into 8 equally sized pieces. Roll each piece into a smooth ball. This is easiest to do if you roll it around on the countertop in a repetitive circular pattern with your hand cupped gently over it. Let the dough balls rest, covered with a clean towel, for 30 minutes. 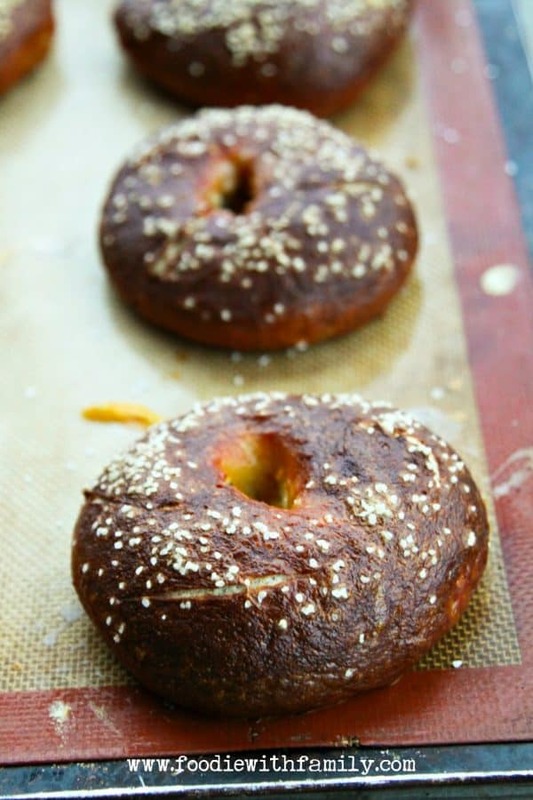 Make the bagel boil by combining the water, baking soda, and brown sugar in a wide, deep pan. Bring to a boil and lower the heat to a simmer. Poke your index finger down through the center of each dough ball to the counter. Pick the dough ball up and gently stretch the hole you made until it is about 2 inches in diameter. Take care not to deflate the dough too much. Place it back on the counter and repeat with the remaining dough. Once they're all done, lower one bagel at a time into the water (lowering the side that was facing up on the countertop into the water first.) Do not overcrowd the pan. Each batch for boiling should be no larger than 4 bagels. 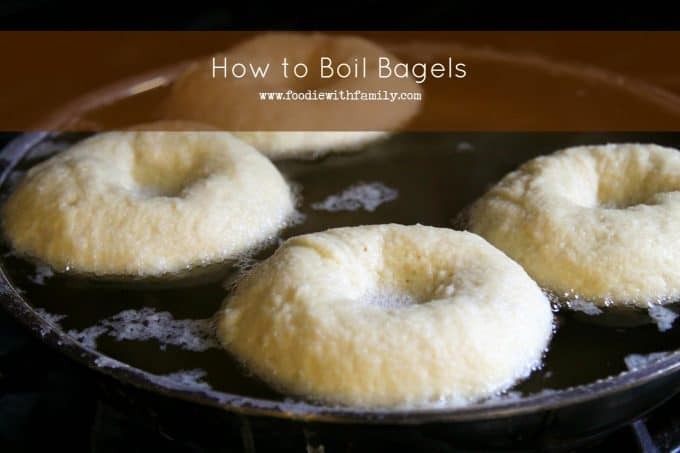 Boil those 4 bagels for 2 minutes on the first side, carefully flip the bagels and boil the second side for 2 minutes. Use a slotted spoon to transfer the bagels to a silpat lined baking sheet (this will keep it from adhering to the pan as they bake). They will not expand greatly while they bake, but should still have a little space between them to allow heat to circulate well. Repeat with the remaining bagels. Brush with the beaten egg or flax egg mixture, sprinkle generously with salt, slash the tops with a sharp knife a couple of times to a depth of about 1/8-inch. Bake the bagels until they are a deep brown colour, about 18 minutes. If you have leftovers, they store best in a paper bag that is not completely sealed. They're best eaten the day they're made, but good toasted the day after! I love your son’s t-shirt. My husband and I coach our kids’ First Lego League team. They are part of a larger Robotics club called Exploding Bacon. All the teams have bacon related names. Love it. This makes my heart (and stomach) happy. A combination of two of the things I love oh so much! Also I made bagels this weekend and I agree that your method turns out much better than rollings and pinching the ends. I did both as a comparison. 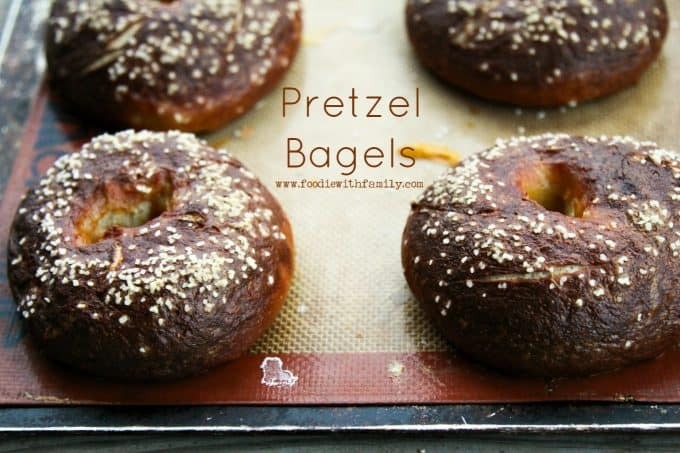 Saved this recipe and will be making these in the very near future since I have all but the pretzel salt on hand (will use kosher salt as you have recommended). My favorite spread for bagels is veggie cream cheese but ya know what? I love sandwiches made with bagels and I bet your bacon wrapped onion rings would make an excellent filling, with lettuce and sliced tomato. I think you’re my food soul mate! 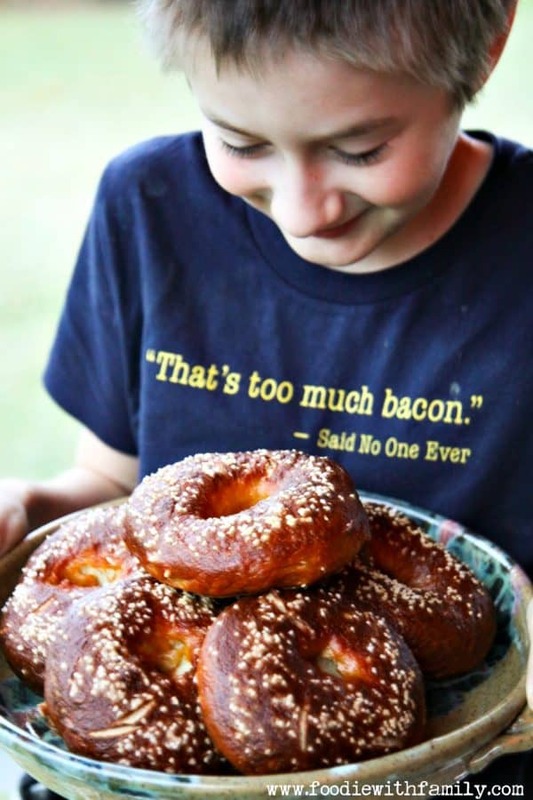 Pretzel Bagels, Bacon Onion Rings – you’re speaking deep to me. I adore pretzel bagels. I am a soft pretzel-holic and want them in every form possible. 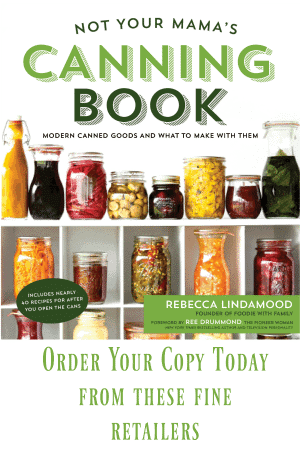 I love how you really break down the process here so that anyone can become an expert! Do these freeze well in case you want to save some for later? I have not tested it, but I don’t think the salt would hold up well in the freezer. If you were going to freeze them, I’d advise not salting the tops. I’m sure you could, as lye is the traditional alkaline component for pretzel boils. Because it’s not super friendly to have around kids and critters, though, I haven’t experimented with it. I’d love to know what your results are if you try it! If you use a stronger base, like lye, I suppose you separate the boiling and dipping-into-lye stages. Have you done this, or just stuck with baking soda, which is safer, I’ll grant you. I have not done this, Denim. I’m purely a baking soda gal here. Until I run out of my 2lb bottle of NaOH, I’ll just keep using it. If I do this, I’ll update.